What a horrible place to be. Coots win and its "yawn, who can't best the Tarholes? If it's recognition you want then go out and collect your blue ribbon and a juice box." I wonder if the Coots win they'll claim it as some kind of redemption for their dreadful loss to UVA and dominance over the ACC. Coots lose and it won't be as bad as losing to the Citadel or Navy, but close. Plus their goose egg streak against the ACC goes on. Anyone know how many games the Coots have lost in a row to the ACC, the conference they say they would always win if they were in it? Looked up the Coot vs ACC record. In the past 4 seasons, Coots are 2-5 vs ACC teams with wins over the Tarholes and NC State. Of the 5 wins against them 4 are ours and UVA has the other. The current streak is Coots 0-3 vs the ACC. Last Coot vs ACC win was a 35-28 game vs NC State in 2017. Last meeting for the Coots vs the Tarholes was in 2015 with the Coots winning 17-13. Both games were not exactly run away victories for the Coots. Yeah, the NC State game was perfect NC State. They beat the tar out of the coots, and then forgot that the point of the game was to put the ball in the endzone. So classic NC State of finding a way to lose even with the coots trying to give them the game. That's not going to be the case with Mack. 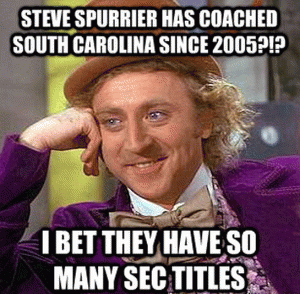 We'll see whether he can still coach, because he should have the talent to beat the Coots. I was thinking the same. But A&M's losses due to players that left may be really devastating in the upcoming season. I thought it will be our toughest game on the schedule. be favored over A&M by ~17 on a neutral field so Vegas is basically valuing Clemson and Bama exactly the same right now. Never bet on a team whose QB is making his first start. Hell, even TL wasn't going to cover the number against Cuse last year if he hadn't gotten hurt. Rypien is gone, and Boise has no experience behind him. And that 2029 class is in what....the third grade? That's gotta be some crazy good Pop Warner team. I wish I could predict that far in advance. However, I am real good at predicting when I need to go to the bathroom.